1. The idea of the all-american, deep south breakfast with cornbread, maple syrup and bacon. I’ve never been to the deep south but I have witnessed people having icecream for breakfast in new York state. 2. 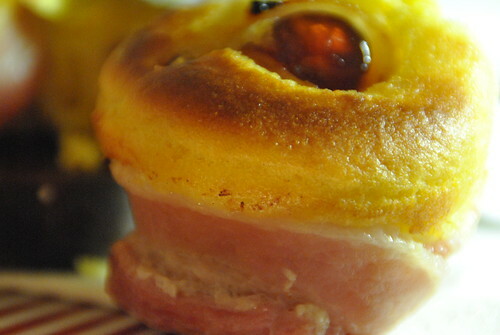 Nigella’s cherry-coke baked ham recipe that rears its sugary head every Christmas. 3. All the sweet bacon products doing the round at the moment like bacon jam, bacon brittle, bacon fudge etc. Cornbread is a revelation. It’s so easy to make and tastes so good. It can be a willing recipient for cheese, chillies and all manner of other options. Plain it goes with chili con carne really well, or a spicy stew. These beauties though, with their pig and fruit combo make for an amazing brunch product. Also, the French Glacé Cherry cheerleaders have given me a branded timer, kitchen scale, apron and samples of French Glacé Cherries to give away. I’ll tell you how at the end. Note: most large supermarkets now have world food sections. I would suggest getting your cornmeal from the Caribbean bit there rather than buying polenta. It’s much cheaper. Grease your muffin tin. 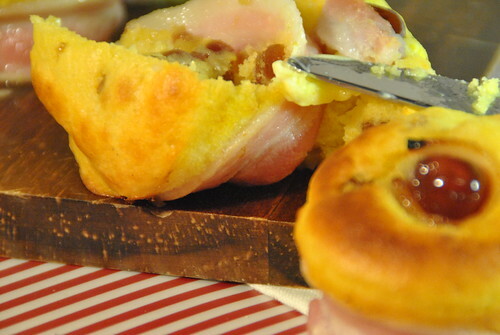 Take a rasher of bacon and wrap it around the edge of each muffin hole to create a “case” with no bottom. Put the cornmeal, flour, baking powder, bicarb, salt and sugar in a bowl. In a jug mix the yoghurt and milk, then add the egg, oil and cherries and beat gently to combine. Add the liquid to the dry mix and stir well until thoroughly mixed. 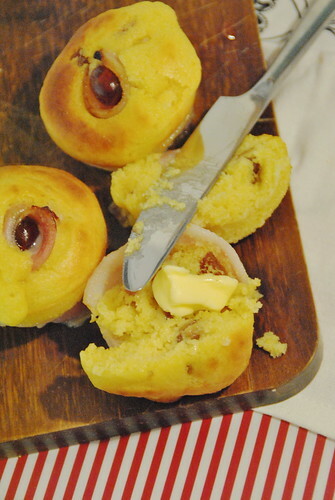 Pour or spoon the mixture into each muffin hole. It won’t rise quite as much as cake, but it will still grow. Take the final bacon rasher and divide along the length to create strips (using the grain of the meat). Cut thumb length pieces and wrap one around each cherry. Place them on top of the muffins. Wait for the muffins to cool a little, place a baking tray over the top and flip them onto it so that they are bottom up. Pop them back into the oven for 10mins at 180c. Serve either on their own with strong coffee, or buttered, or we had them with poached eggs. 2. Leave a comment below telling me what your favourite cherry based memory is, be it cherry coloured or cherry flavoured. I was sent the cherries and given the prize by Sopexa so that I could play around and come up with a new and tasty dish. They are championing French Glace Cherries. If you would like to see another idea, head over to The More Than Occasional Baker to see her cherry and coconut bundt cake. The prize is only available to UK entrants. Your name will be given to spoexa who will be responsible for sending the prize. Entries close at midnight on 31st August. Please makes sure you fill out your details when commenting so that I can contact you. If I am unable to contact you within 48hrs I will try the next person. I will use a random number generator to choose the winner. My favourite cherry memory is of a Northern Irish delight called Fifteens, made with 15 crushed digestive biscuits, 15 marshmallows, 15 glace cherries and condensed milk, all mixed together and rolled in coconut. It was always such a treat in our house…licking the condensed milk spoon, beating the living daylights out of the biscuits to crush them, chopping the sticky cherries and getting to lick your fingers afterwards, rolling the the mix in coconut, and the first delicious slice straight from the fridge…every last bit a joy. I don’t live in Northern Ireland any more, but Fifteens are a tradition that has stuck with me across the miles and down the years. This is a bit sad, but my Mum randomly bought cherries for after lunch the other week whilst I visited her, whilst I was there I went for a run, I came back and starting snacking on cherries whilst still sweaty and horrible. I don’t think cherries have ever tasted sweeter and the were the perfect post run snack. I think the taste of those cherries at that moment, in the sunshine, full of post run endorphins will stay with me for a long time! When my children were small I took them for a day at a theme park with a friend and her children. I’d taken along a bag of cherries for a treat, and when I picked them out of my bag the two-year-old shouted “Cherries!” so loudly that everyone in the park must have heard – even the ducks came to see what was going on. Quite a crowd collected – just to watch us munching cherries. You clearly started the children’s healthy snacking campaign before it was trendy – and with more success. Oh gosh, I want to live there. Sounds lovely. My Nanna made the BEST cherry pie, but it was using tinned filling. It was her pastry that made it. Congratulations Eric, you are the winner! I know this sounds sill but my first ever My Little Pony was Cherries Jubilee and she had cherries painted on her bottom! My mum used to (and still does) make her own Christmas cake and I always helped her – chopping the cherries into halves on a plate with flour to stop them sticking to my knife and fingers! I may or may not have eaten all the glace cherries out of a mini christmas cake one year when I didn’t fancy the cake and no-one else was going to eat it, but sssshhh let’s not tell anyone. Making christmas pudding with my mum and cutting lots of glace cherries in half and sticking them around the edge of a bowl. I still make the same type for my family now! My Mum was a great baker and she made the most fantastic Eiffel Towers with glace cherries on top. I’ve tried to make them but they’re just not as good as Mum’s. Ditto her Empire Bicuits, also with glace cherries on top! What are these eiffel towers you speak of? They sound amazing. My favourite cherry memory is of my Mum making us iced buns with a cherry on top. I always ate the cherry first. Sounds like exactly the correct way to eat them. We went to New England a few years ago and I saw all the cherry tree orchards. It was amazing. We bought pounds and pounds of them to gorge on. What i thought of as a luxury was ‘ordinary’ there. I loved the peachy coloured Rainier cherries the best. I’ve never seen a cherry orchard, but we went on holiday to Lisbon there and they were selling massive punnets really cheap – came back and they were £2 for a tiny one. Sounds like a lovely holiday. My grandma had a cherry orchard, and my fave memories are of me climbing high up to pick the cherries. Proper cherries, of our variety, not the sweet ones you get in the supermarkets. They were fab for jams, with cherries swimming in dark ruby syrup. My grandma also used to make a cherry wine, but being not old enough, I wasn’t allowed to taste it. I remember as a child always having a brown paper bag full of cherries when we went to the beach at Sandbanks. They were always so juicy when we were hot and even if you dropped one the sand was easy to rub off before you popped it in your mouth. We weren’t allowed to waste any! It’s actually quite recent, we went to Stonhenge and walking back to the visitor centre a man was selling them at the roadside. They were the most juicy, tasty cherries I’ve ever had. Perfect on a hot day. It was quite recent, walking back from Stonehenge to the visitors centre we bought cherries from a roadside stall. They were the most delicious, juicy cherries I’ve ever tasted. Perfect for a hot day. Mom always used to make cakes for Sunday tea and i always liked it when she made coconut pyramids and she used to put a cherry on the top.I always had to leave the cherry top till the last mouthful.When ever i see glace cherries now i always think of my dear mom and those lovely cakes she used to make. My favourite cherry memory is definitely eating cherry drops during lessons at school. I haven’t seen them in shops since! I love morello cherry jam. It was a special childhood treat and it still is. I’m now and adult aged 52 and a bit. But also fresh cherries and my speciality for family dinners, my own cherry pie. I love cherries. Back in the 70’s my mum always had a jar of maraschino cherries in the drinks cabinet to go with various trendy cocktails of the time. I was always popping into the cupboard to take a couple. She must have noticed as the jars were tiny. I also regularly raided the tub of glace cherries that only seemed to be used to make Christmas cake. Cherry pop we used to get from the milkman when I was small.